Manufacturer: Charles Gross & Co.
Additional Information: Issued at the same time as and even rarer than the 1887 Kalamazoo Bats (N690) set. 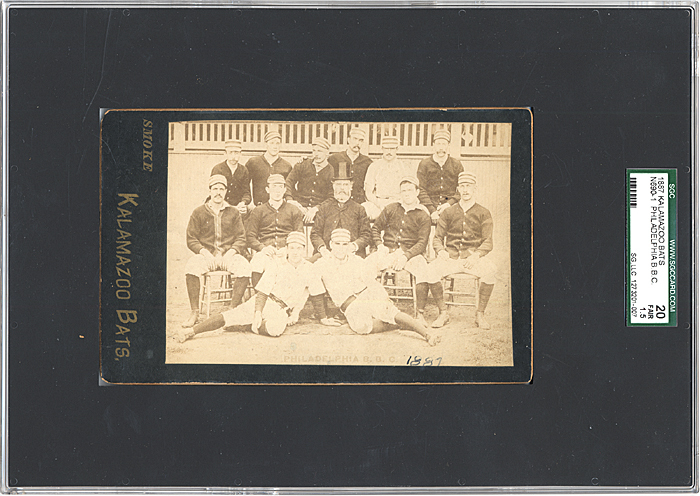 SCD’s 2011 Standard Catalog of Baseball Cards (p. 196) says the following about these cabinet cards: “One variety displays the photo on a black mount with the words ‘Smoke Kalamazoo Bats’ embossed in gold to the left. 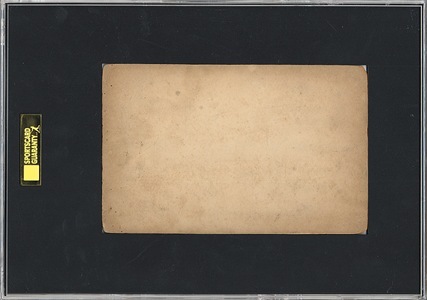 The other contains no advertising, although there is an oval embossment on the card, along with the words ‘Chas. Gross & Co.’ and an 1887 copyright line. These cards also have a distinctive pink color on the back of the cardboard mount.” Look closely above the base on the Tom Gunning photo to the right (you may need to click on the photo to see in the necessary degree of detail), and you can see the oval embossment referenced by SCD. Because the cards were produced in Philadelphia, the set contains an inordinately high percentage of Phillies cards. 21 of the 39 cards listed in the 2011 Standard Catalog are Phillies. Note that Beckett does not list the set; instead, it appears to confuse the N690-1 designation with the Kalazmazoo Bats (N690) set. 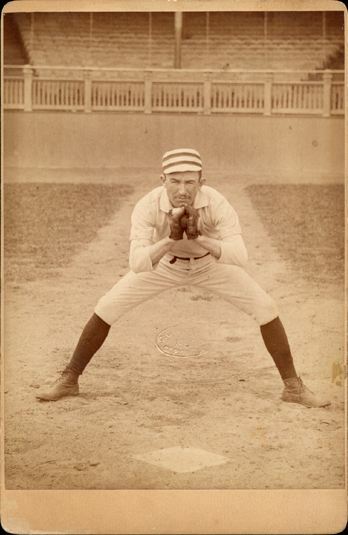 The Tom Gunning image comes from a page on Litwack.org which extensively displays a large number of cards from this regular Kalamazoo Bats (N690) set. The images of the Philadelphia B.B.C. 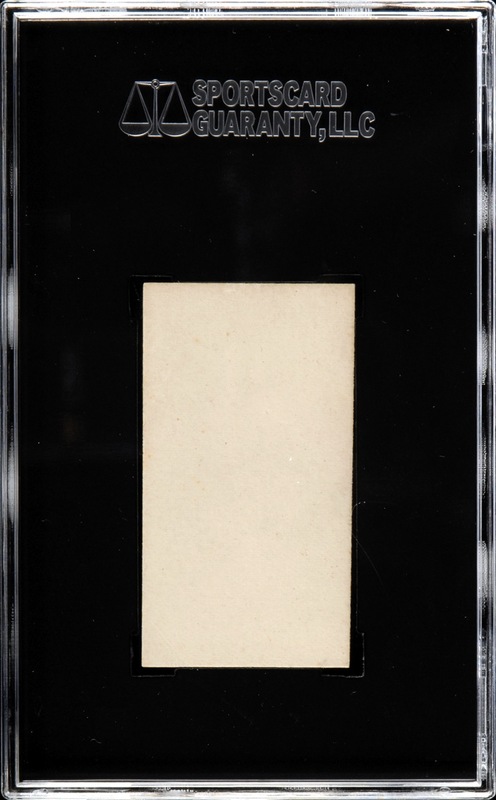 card come from Robert Edward Auctions, which auctioned the card in May, 2011. For even more information regarding the Kalamazoo Bats Cabinets, and a look at the seedy underside of vintage memorabilia collecting, you may want to read on Peter J. Nash’s Hauls of Shame website a report which details the theft of a number of Phillies Kalamazoo Bats Cabinets from the New York Public Library. Additional Information: The checklist below comes directly from the SCD’s 2011 Standard Catalog of Baseball Cards. The cards are blank-backed and unnumbered. SCD’s checklist skip-numbers the cards to align the players with the numbering assigned to the closely-related 1887-1890 Old Judge (N172) set — which uses nearly all of the same photos. Beckett’s online guide currently lists nothing about the set. 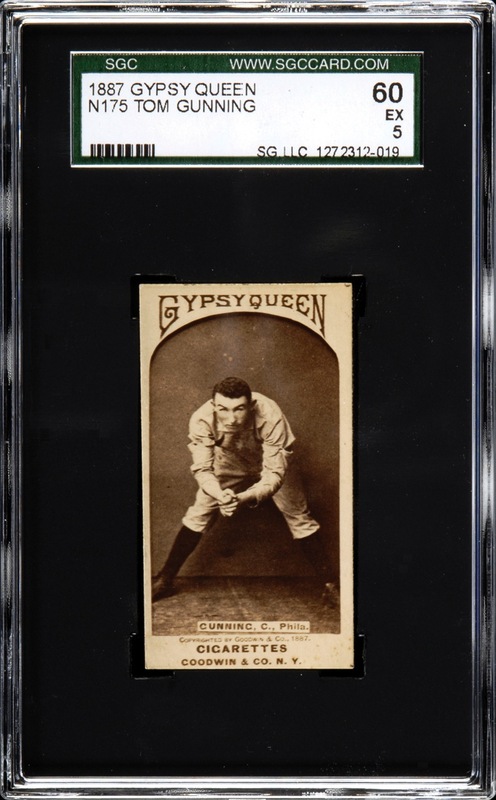 While Topps’s 2011 Topps Gypsy Queen set and its related inserts borrow the 1887 Gypsy Queen border, the use of stylized color photography and action photos make it difficult to state that the set truly recycles the look and feel of the original set. The Gunning card images above come from a page on the Legendary Auctions website.